Over the past two seasons, members of the Boone Central girls golf team have proven they are plenty tough, as well as talented. The Lady Cardinals won their first state title a year ago in cold, rainy weather that shortened the championship event to one day. They braved similarly miserable conditions this season to run away with championships in the Boone Central and Wayne Invitational tournaments. 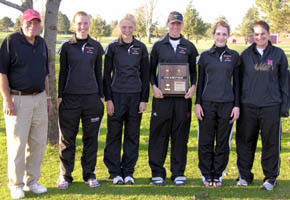 Monday, the gritty Cards battled through howling winds at the Atkinson-Stuart Golf Course to handily win the C-3 District tournament and earn the chance to defend their 2009 state crown. Boone Central took a 31-stroke lead over nearest challenger Columbus Scotus through nine holes, then pulled away to win the C-3 title by a 391-429 margin over the Shamrocks. Fullerton placed third at 462. “You can see by the scores that it was a tough day. The wind blew quite hard all day,” said Card Coach Dennis Walters. “It was hard to even keep the ball on some of the greens, as the wind and slope of the green would take the ball all the way off after it was chipped on. Boone Central fashioned its winning team total with three of the top five individual medalists. Senior Brooke Bolin fired an 87 for second place and junior Britany Seda was right behind in third with an 88. Sophomore Amy Ahlers placed fifth with a 98. Claire Kizisek of Ainsworth was the district medalist, shooting 83. Rounding out the Cardinal team score was Breann Thorberg’s 118. Emily Niewohner shot 123. Details on Additional Tournaments in Print & Online Editions of Albion News.